"HANGTOWN FRY" - PROBABLY THE MOST FAMOUS EGG DISH OF THE AMERICAN WEST. As the story goes, a prospector during the California Gold Rush struck it rich. After his "poke" was weighed, and confirmed his good fortune, he went to a diner nearby and told the proprietor he wanted the best meal money could buy. This consisted of fried oysters, bacon and eggs. Pricey, heady stuff for those days. This took place in Placerville, California, a small mining town in the California foothills. The town was not only known for the method of "Placer Mining", but gained the name of "Hangtown" for its reputation for quick justice. Of course the diner was located across the street from, what else?.... "Hangman's Tree". The fame of this dish rapidly spread throughout the state of California, and most notably, San Francisco, the city built on the good fortune of the California Gold Rush. 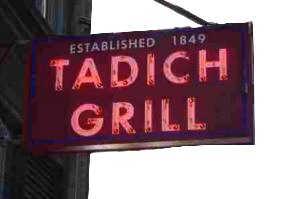 Tadich Grill, an eating establishment founded in 1849, and still in business today, was one of the first to serve this truly California dish. Situated in the San Francisco Financial District, it is well known for its seafood and early California fare. Tadich Grill is one of the most famous restaurants in the state of California. You probably can't get "Hangtown Fry" in many restaurants today. but here is how to make and enjoy it. the cream, salt and pepper. of the oysters. 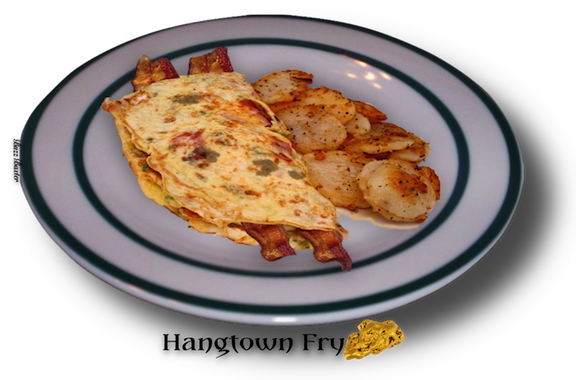 Fold the omelet over, remove it to a plate and serve hot. •	The bacon can be crumbled and stirred into the eggs.